1 - I have a lot of mods installed already that I like and want to keep. Can I still use the S.B.P. ENB settings? You just need to uninstall any mod that alters lighting (ELFX, RLO, etc. ), and you absolutely need to use/install "Climates Of Tamriel 3" and the "CoT - Weather Patch". I would also recommend installing "Supreme Storms" and "Expanded Snow Systems" and maybe go through the HD textures as well. *Those changes have no impact on your save-games, and you can easily change everything back again if you are not happy with the result. 2 - I want to use both the S.B.P. mods and ENB, but I would like to continue my saved game instead of starting over. If you have a savegame from a game without mods, you can use that savegame without any problems. Just follow the guide and use your savegame afterwards. If you want to use a savegame from an already modded skyrim, but you want to exchange your current mods with the SBP mods and ENB, then you need to clean your savegame before you can use it. No problem either. ..But this requires a small cleanup after making the changes to your mods. As Skyrim saves a ridiculous amount of data in the save-game files, you can't just remove data from the game without getting errors. Unfortunately all scripts are stored in the save-game files, so if you uninstall a mod that contains scripts, these scripts will still be loaded with your game, even if you remove the mod. Having scripts constantly looking for missing content, creates constant errors in the Papyrus, which causes lag and crashes. 1 - Download "TESVESSE Files Editor" from the Nexus site (LINK) Download manually, and unpack the 7z package to any directory. Make a shortcut to "TESVESSE.exe". 3 - Start Skyrim and load your save-game. In-game, go to a small cell (Any player-home will do) and bring down the console. Type: "clearinvalidregistrations" and press enter. Leave the console again and create a new save-game. Exit Skyrim. 4 - Start the "TESVESSE Files Editor" and open the save-game you just created. The save-games are usually located in: "C:\Users\(Username)\Documents\My Games\Skyrim\Saves\"
In the left window, expand "Global data table 3", and click "2 Papyrus". Press "Empty papyrus". This will remove all scripts from your save-game. Now save to a new save-game file. 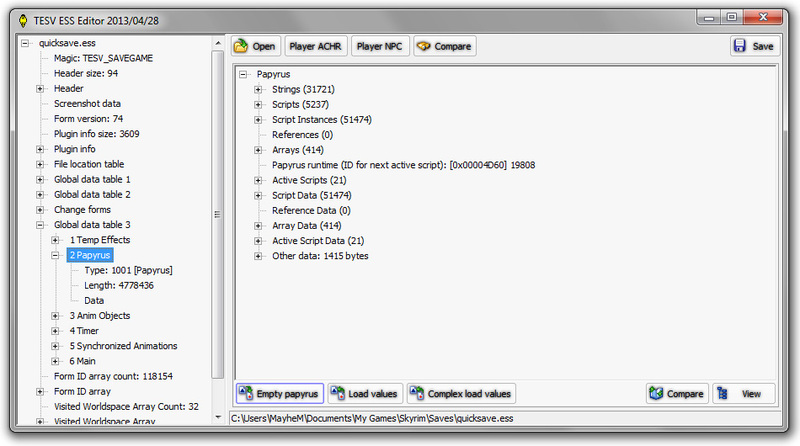 5 - Start Skyrim and load your new script-free save-game. Once the game starts, all scripts from the base-game and current mods will be added, so let the game be for a couple of seconds. Some settings like customized camera views RaceMenu sliders and such might have gotten lost, but aside from that, everything should work just fine. If you get a CTD on this first load, no worries. It only happens because the cache doesn't match the loaded game. Just load the game once again, and everything will work just fine. Most likely you have some loose scripts in your save-game. Unfortunately all scripts are being saved in the save-game files, and after playing for some time, they sometimes mess up. Re-spawning of creatures, and the use of mannequins and weapon racks, are common causes of script errors, but there are many other. There is no way to know for sure, if scripts are in fact the problem, but if you activate papyrus logging, you will get an idea. Open up you skyrim.ini file with a note-pad "C:\Users\(Username)\Documents\My Games\Skyrim\). Start Skyrim again, and wait for a CTD or an endless loading screen or whatever the problem might be. After Skyrim has crashed, go to "C:\Users\(Username)\Documents\My Games\Skyrim\Logs\Script\". Here you will find a log file, which will show what happened before the CTD/Shotdown. * If you see errors pointing to a specific mod, try removing the mod. * If you don't see anything suspicious at all in the log, you might have too many textures loaded for your system to handle. You will need to remove some of the texture packs. Start with the ones covering the textures in the area where you see the problem most often. If it's completely random where it happens, you might want to look into both your environment texture-packs, and armor/NPC mods. Try to see where you can save the most memory. The Papyrus log can be a mess to look at in a note-pad. If you have strange CTDs, and you find the log to be larger than 100kb in size, then you definitely need to have a closer look at it. Open the log and try to look for errors, especially those that are repeated, or those that are at the very bottom, right before the crash. Now try to uninstall the mod which created the error, and see if the problem has disappeared. *Remember to test with a cleaned savegame (See FAQ number 2), otherwise the script will still be present, even after removing the mod. This will happen if the included "dxgi.dll" from the ENB package doesn't "match" your system or drivers. In that case, just rename the file to "dxgi.dll.backup". The ENB will look for the file inside your system32/SysWOW64 directory instead, which should definitely match your system. If the problem still persists, then you need to reinstall DirectX 9c. (LINK) *DirectX 9c is actually not pre-installed on Win10. Every monitor is different, and everyone has different display settings, so what looks good on one display, might look too dark or too bright on another. *Open up the ENB settings in-game (Shift+Enter), and find "Brightness". Change this to matches your monitor and personal preference. 1 - Most likely this has the same reason as mentioned in FAQ number 5 above. 7 - I just installed the weather mods and the ENB, but everything looks weird? This happens because the weather system has not started it's cycle yet. Give it about 24 in-game hours, and everything will look MUCH better. The ENB is made for the weather mod, so when it's not in effect yet, the ENB won't look great either. Quick fix: Find a bed and sleep for 24 hours. This is most likely due to corrupt item references in your save-game, or simply too many ID references. This can be easily fixed with a cell re-spawn. In-game, go to any player-home and sleep for 30 days. That will reset all cells except the "safe cells". *Make sure have all your stuff stored in your home before going to sleep, or you will loose them. It can also happen if you don't have video memory enough. If you bring 40 followers to the same house, and all have HD textures, you will most likely get problems even with 4GB+. This is typically caused by having 4k size tree LODs. Change to 2k instead. This will cause a slight decrease in distant quality, but the endless loading screen will go away. Go to Nexus and install AOF HD Tree LODs 2k version (LINK) Under Optional-Files, install "AOF HD Tree LODs 2k"
Find [Imagespace], and change the line "bDoDepthOfField=0" to "bDoDepthOfField=1"
13 - I see grass floating in the air?? 14 - I can't see any difference in the graphics, even though I installed the ENB settings. This happens if you didn't change the ini files, as shown on the Tweaks page - LINK. If your SkyrimPrefs.ini doesn't contain the following strings, ENB will not activate. The ENB render has it's own AA, so if you activate any form of AA in the SkyrimPrefs.ini, it will deactivate the ENB settings completely. 15 - I get an invisible wall behind the enchanter in Vlindrel Hall. 16 - Random textures are invisible? 17 - The puddles at the marketplace in Windhelm are purple. 18 - I get a super annoying idle animation. The character does silly turnarounds. 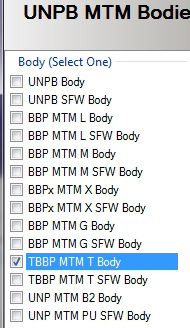 This happens if you by accident installed the animation pack that cam with the UNPB-TBBP female body replacer. Just uninstall the mod, the install it again with the following options. 19 - The sun shines through everything. Trees and buildings and mountains? 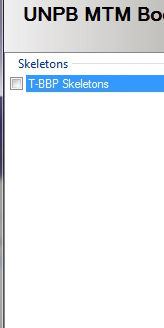 This may happen if you have not set "bFloatPointRenderTarget=1" in the "SkyrimPrefs.ini" file. Find [Display], and change or add the line: "bFloatPointRenderTarget=1"
20 - All or some NPCs have gray faces. This may happen if you have an incorrect load-order between mods that contain NPCs with loose files instead of bsa/esm archives. It also may happen, if you have two mods that use the same character ID. (If you only have SBP recommended mods installed, you will not see this problem) But if you have added more non-standalone characters to the game, try uninstalling them and see if the problem disappears. 21 - After gathering 2 or more followers at the same time, I get CTDs now and then? Note: Before cleaning your save-game, you need to dismiss all followers, uninstall "Amazing Follower Tweaks", and make a new save. Then clean this save-game, start Skyrim and make yet a new save-game. Then re-install "Amazing Follower Tweaks", and everything will be back to normal, and the error gone. 22 - NPCs get black eyes. This may happen on certain systems, with certain drivers, with certain settings, after playing for a certain amount of time. I have personally never seen this myself, but if for whatever reason you experience this, then It's very easy to fix. In-game, open the ENB menu (shift+enter), deactivate and reactivate AA, and re-apply settings. That's it. 23 - The shadows are not that great, but the ENB settings are at it's best option? The screenshots are taken with "iShadowMapResolution=2048", but you can set the number to 512, 1024, 2048 or 4096. On low end systems, 2048 and higher comes with a small decrease in performance. In my opinion, the quality difference between 2048 and 4096 is minimal. That is however a matter of taste, so if you are not satisfied with 2048 shadow resolution, try 4096 instead. 24 - Nightvision doesn't work? For some reason, nightvision doesn't work on some systems with ENB enabled. This can however easily be fixed. Change the line "// #define APPLYGAMECOLORCORRECTION" to "#define APPLYGAMECOLORCORRECTION". This should make nightvision work perfectly on any system. 25 - I want to use different mods than the recommended ones, but I get CTDs and other problems. If you post your mod-list and load-order on the blog, I'll take a look. I can't promise that I can help, but I'll try my best. 26 - I can't find the download link on Boris's website. Where is it? Click on the version you want. (Probably the latest) At the download page, scroll to the very bottom, and the download link will be a tiny square. I know, not the first place people look, and I would certainly have put it somewhere else, but that's Boris's choice. 27 - I want black cinematic bars on the top and bottom of the screen? Is there an ENB option for that? Yes. If you want black cinematic bars, you just need to add some text to the "enbeffect.fx" file. "enbeffect.fx" is found in the Skyrim folder. Open it in a notepad, and find the line that says: "_oC0.xyz=color.xyz". "#define LETTERBOX_BARS 1" to "#define LETTERBOX_BARS 0"
28 - The water is flickering, how do I make it stop? Flickering is very difficult to get rid of, as it's different from system to system. It's mostly dependant on the graphic card drivers and settings, but also on the game settings. I have researched a LOT on this, but didn't find anything that eliminates the problem. The only thing you can do is play around with your driver settings and see if you can find a pattern. 29 - The game crashes right before/after the menu. 30 - The game crashes almost immediately after launch. This problem was introduced in the Creators "Update" of Windows 10. This fix worked for me (LINK) See number 4. 31 - The loading screens look way too bright some times. This happens from time to time. It may even happen in-game right after you load a save-game for the first time. If it does, just enter another cell and it will go away for good. Why the loading screen becomes too bright now and then, I honestly don't know. It only happens with ENB 3.05 and newer. However, since it only happens to the loading screens, I have not invested THAT much time looking into it. This mod has an error that will make the game CTD. Regardless, I still highly recommend the mod, as the error is very easy to avoid. See number 3. 1 - The dialog is missing. 2 - The animations don't work. This will happen for sure if you forgot to run the FNIS tool after installing. It can also happen if you try to activate a scene in a place that's too small. 3 - The game CTD after the scene finished. This will happen if you wear special cloths or armor from a mod. Use standard armor (And make sure the NPC(s) wear standard armor too), and he mod will work just fine. It's caused by the "equip armor" function after the scene. 4 - The animation is running, but it's way off. Go to the in-game menu and set scaling to "On".. For some reason it's "Off" as standard. If that doesn't work, maybe the place is to small for the scene. Find another place. It can also happen if you start the scene in 1st person. Try switching to 3rd person before initializing. 5 - I use a female character, but the voice indicate I'm male. That's just a feature. Hopefully it will be fixed in the future. 33 - When I try to install a certain mod with NMM, I get this error "An exception occured in the script". This can happen with mods that have scripted installers. Solution: Add shell extensions for supported file types in NMM settings. Then restart NMM. 34 - I can't find my question(s) here. Try the Nexus SBP Blog - There are some answered questions already, and you can post any new question you might have.